Woman broke into car, used stolen credit card, police say | Crime Stoppers of the Lowcountry: 554-1111 | 1-888-CRIME-SC | Anonymous tips earn cash rewards with Crime Stoppers of the Lowcountry. JAMES ISLAND, SC (WCSC) - Charleston police are looking for a woman they say used a stolen credit card within hours of breaking into a car and taking it last week. Investigators released surveillance photos of the suspect Thursday. 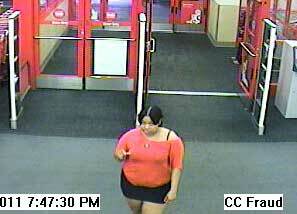 She is wanted for breaking into a car Sept. 24 at the James Island County Park and using a stolen credit card. The suspect is described as a light skinned black female, between 5'7" and 5'9", weighing about 230 pounds. She is between 25 and 35 years old. Anyone with information about the suspect can call Sgt. Dustin Thompson at 720-3916.